Just like a floor lamp, an armchair can instantly uplift a space. However, it’s also one of those items that can make or break the space around it, linking up design details or sticking out like a sore thumb. Even if the other existing furniture pieces and room layout play a big role, the functionality and ergonomics of the chair are key factors. If you’re currently trying to find the perfect armchair, here are a few things you might want to think about before you make that choice. Consider all other elements in the space first, such as existing furniture, flooring, wall colours and lighting. The armchair needs to complement the sofa, but it’s much more interesting to select from a different range – so the setting isn’t too “matchy”. Contrasting upholstery can offer a point of difference. Here the Osaka sofa in a lovely turquoise fabric is teamed with the Ogi armchair in white leather for a contrasting effect that creates a striking and fresh mood. On the other hand, the classic Monte armchair in a dark grey leather contrasts beautifully against the soft texture of the sofa in a luscious golden tone and creates an overall formal tone. More contrast can be created in the finer details including studding, piping and legs. Below, the tufting on the Boston chair adds a nice detail. For something that will really stand out, look for details such as the unusual design of the Flow chair. Available space – if your room has enough space and you need more seating space, you can opt for more than one armchair. For a coherent look, you can go for symmetry, such as these two Osaka and Fly armchairs. The upholstery of the Fly armchairs, although different to the sofa still ties in with the overall colour scheme and feel of the room, and the symmetry of the chairs helps to pull everything together seamlessly. What is the purpose of the armchair and where will it be?An armchair in a living room usually plays a different purpose to one placed in a bedroom, kids room, reading nook or office. In a living room the armchair could become the focal point, but it is also commonly used to create additional social seating alongside the sofa. In the bedroom comfort and cosiness are key, such as the Imola which cradles you in luxury, whilst in a kids bedroom, a colourful organic shaped chair such as the Schelly instantly adds a dose of fun and liveliness to the room. A reading nook can easily be set up by choosing a comfortable, soft chair such as the fusion and teaming it with a small side table, throw and a lamp. This makes the area particularly inviting.In an office environment, such as the one pictured below, selecting a number of different armchairs in coordinating upholstery creates an unusual and interesting space. How does the chair feel? Consider the rake of the chair – how far forward or back you are positioned when you sit in the chair. You may want something more upright or something more relaxed depending on who and for what it will be used. Also look at the depth and height of the seat to make sure these work too. For relaxation or for ease of getting up, you may want to consider a recliner, which nowadays come in many different formats and features. The Harvard recliner is a distinctive armchair and comes in either a manual, battery-operated or electrical reclining function. The Premium edition also comes with a USB port to keep your devices charged. Style – there are countless styles available, from classic, contemporary and retro to modern, ultra modern and avant garde. Apart from the main shape of the chair, the style is enhanced and defined also through the types of legs chosen and upholstery. Brushed steel and stainless steel legs (or chairs made from a single mould) are usually considered modern pieces, whilst wooden and veneered finishes lend themselves well to classic and contemporary styles, such as the To be chair and the Osaka chair with a tufted seat and slanted arms, reminiscent of retro 60s style. Choose upholstery that’s right for your lifestyle – Fall for a classic, timeless leather number, such as the Monte armchair below or choose fabric if you’re after creating texture, cosiness, or a colour that stands out. The best thing about good quality real leather is that it ages beautifully – the more beaten up it gets, the finer and more authentic it looks. While leather is more expensive than fabric, it’s an investment piece that will serve well for years. When choosing fabric however, consider your family members – if you have pets, for instance, plush velvet may not be the most practical choice and if you have small children, washable loose covers are a sensible option. In a more grown-up room, a fabulous fabric could be the perfect finishing touch.For families, there are many great fabrics to choose from with high rub ratings and fabric protection can be applied. Budget – what you are ready to pay determines whether you can consider original designs, replicas or re-interpretations. Even if you don’t fancy splurging on an original design, there are still many options of armchairs that are considered Design Icons because their design and features have been thoroughly featured and have international appeal. 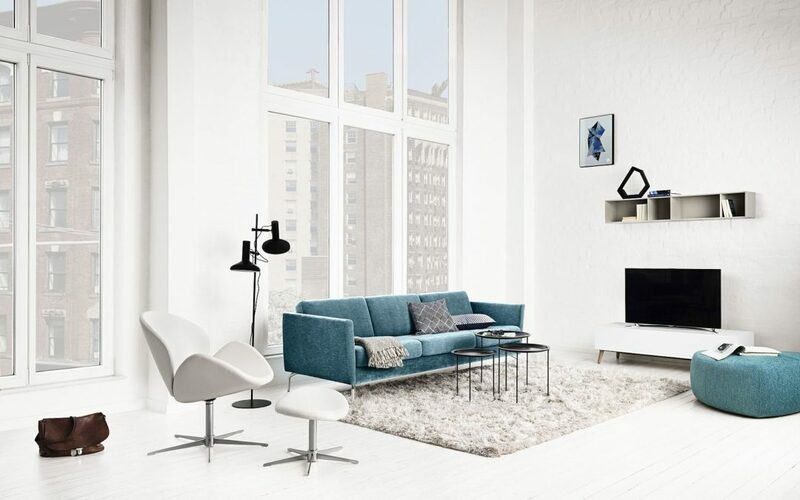 The Imola chair has long been considered a Design Icon for BoConcept because it delivers both on design, functionality and customization options. The elegance of its form and the gracefulness of its curves are inspired by and elevated from the lines of a tennis ball. Do you like the look of the chair? This is key, as your armchair will be with you for many years. Art deco and retro styles are currently very popular and their resurgence in fashion and interior design has influenced the style of many current armchairs. They are easy on the eye, as well as being simple to match to most rooms. The simplicity of mid century and Scandinavian designs are also other good looking alternatives. Deep buttoning is a popular feature suited to both fabric and leather upholstery. Here, the Carlton chair in a luxurious blue fabric is reminiscent of the stylish, upper class homes of the 60s and 70s and is light, elegant and refined.